In case you haven't noticed, Tim, Cleveland fans take their football seriously. Hey, if you think they love your now, just imagine what it'll be like if you lead the Browns to the playoffs. Those fans are gonna worship you like Zeus. You'll be the god of all gods...in Cleveland, at least. I wonder who held their job longer, Tim Couch or the guy who wrote the "epitaph" on the back of the card. The card reads like one half of a drunken football argument! And yes, that is an uncorrected grammar error. 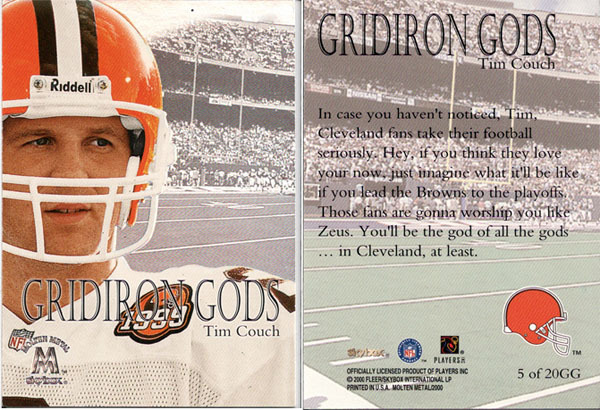 Who would ever thought that an actual "Zeus" card would be worth more than any Tim Couch card (2010 Allen & Ginter)? I can't believe the next Bo Jackson wasted his career sucking at Defensive End! Now it makes sense why he was so slow, he was using his "avalanche" speed running up hill, thank god (Tim Couch) the coaching staff got fired for this! No Running Back has been more of a ground-gainer in college football history. Dayne left Wisconsin as the all-time leader in career rushing yards among collegians. With his powerful body, quick feet and great vision, Ron can easily burst for huge gains. Had he been able to "easily burst for huge gains", I probably would have an extra fantasy football championship ring on my hand right now! 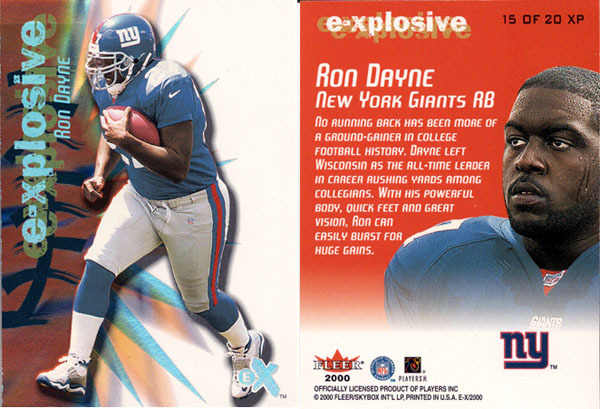 On a side note, would Ron Dayne be a "poor man's LenDale White" or would LenDale White be a "poor man's Ron Dayne"? At least Tiki Barber didn't divorce himself from "thunder & lightning" the way Chris Johnson did with "Smash & Dash". "He's the biggest, the strongest, the fastest, and he's probably the hardest worker of all of them. He has more of a driving passion to be the best." -Washington State Coach Mike Price Comparing Leaf to the other NFL quarterbacks to come out of Washington State. He could have been the next Jeff George with a skill set like that.....That's a bold statement by Mike Price to say that Ryan Leaf was faster than Washington State alums Drew Bledsoe and Mark Rypien. I would like to see someone arrange that race so I could judge for myself. It would also prove who has more "driving passion" based on who shows up for the race. Ryan Leaf only got 10-years probation for stealing pills, so he would have no excuse for not showing up. He could throw John Elway's "Nerf Vortex" football 75-yards. 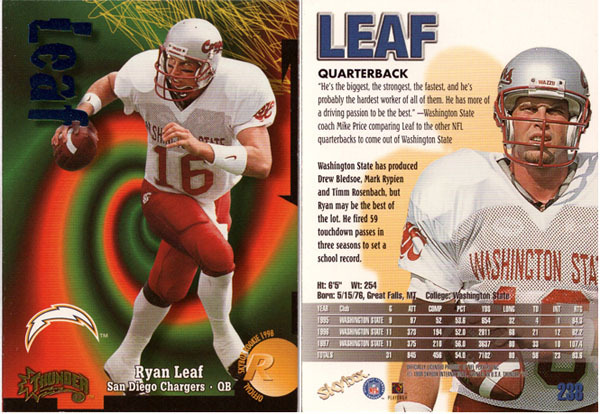 My favorite is definitely the Ryan Leaf card because of his coach’s quote on the back. Ron Dayne’s picture by itself should have been a red flag….it looks like he is speed walking!